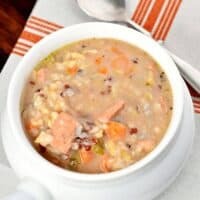 Grab a spoon, this creamy Chicken Wild Rice Soup is the perfect comfort food for dinner tonight! 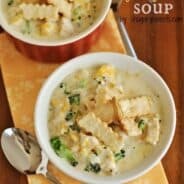 It’s also great using leftover turkey!! Only a couple days until the big turkey eating festivities! 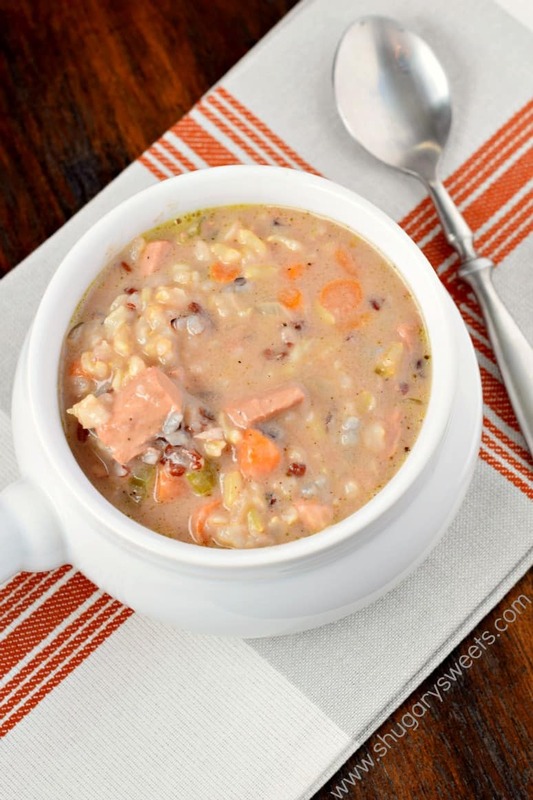 I made this Chicken Wild Rice Soup last week with some leftover, cooked chicken. But, I thought it would also be PERFECT for some of that leftover turkey too. You know, when you’ve gotten to the point that you can’t eat another plate of turkey and gravy. Another turkey sandwich. 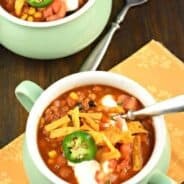 THIS recipe will come to the rescue!! At the end of today’s post, I’ve got a few other recipes that would be great to use with leftover turkey. I’m not sure about you, but I cook WAY more turkey than my family needs this holiday. I do it on purpose, because I love putting it in ziploc freezer bags for later use. 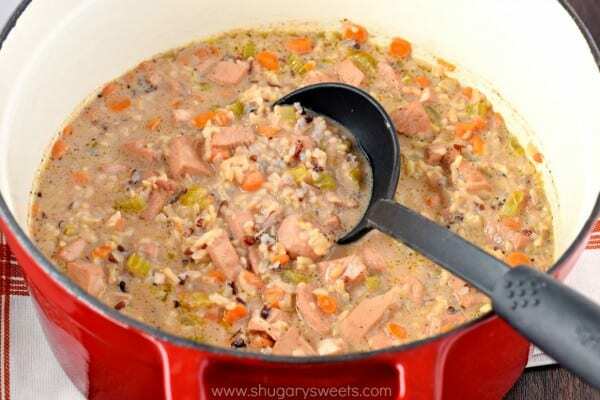 I put about 2-3 cups of diced turkey in each bag, which is usually enough for any recipe! So, what’s your favorite thing about Thanksgiving dinner? For me it’s got to be the stuffing. Topped with a perfect gravy and I’m a happy girl. Although my mother in law’s potatoes make an appearance, as well as mom’s cheesy hashbrown casserole and this frozen cranberry salad. And who can forget dessert? Well, my stomach is growling. I’ll see you all next week when I’m eating lettuce. haha!! In a 5 qt dutch oven over medium high heat, saute butter with onion, carrots, and celery for about 3 minutes. Sprinkle flour over vegetables and cook for an additional minute or two, until thick. Add in seasonings, chicken, broth, cream and rice. Stir until combined. Reduce heat to simmer (low) and cover. Cook for about 50 minutes, stirring occasionally. Serve and enjoy! 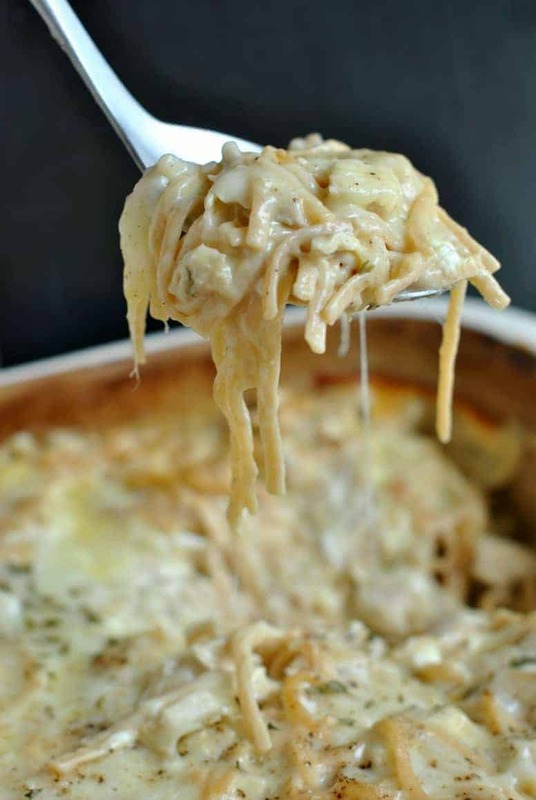 Chicken Tetrazzini would be amazing with leftover turkey instead! 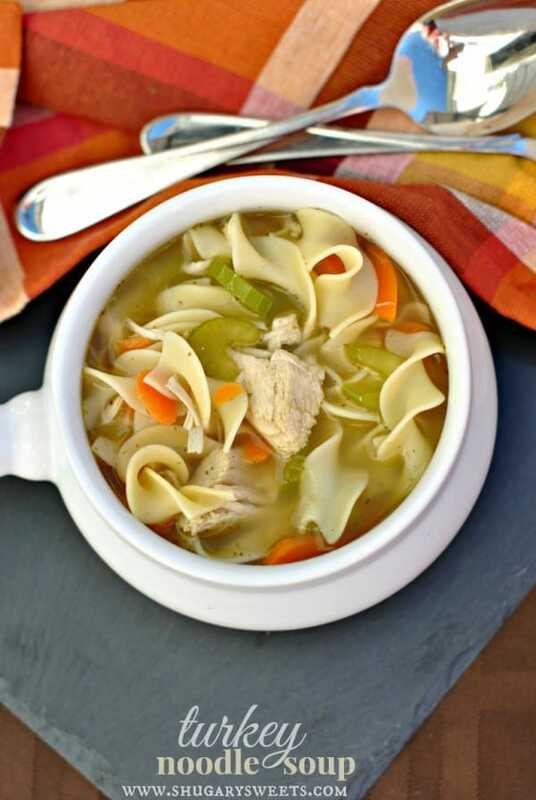 Turkey Noodle Soup: a classic soup made with turkey (or chicken!) Great on a chilly winter evening! Turkey Taco Soup: creamy and comforting, this soup is a must have after Thanksgiving! 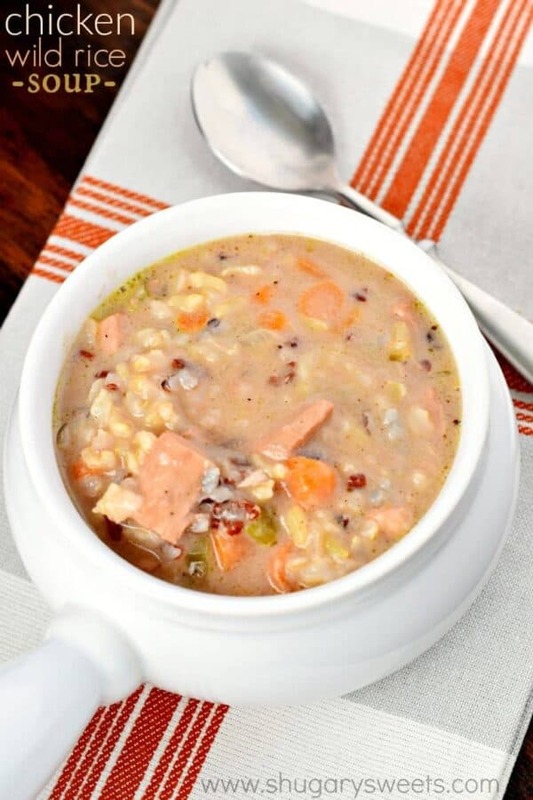 And the wild rice is….where….? This looks tasty! I made one similar, but i just throw in a package of Uncle Ben’s ready (wild)rice. 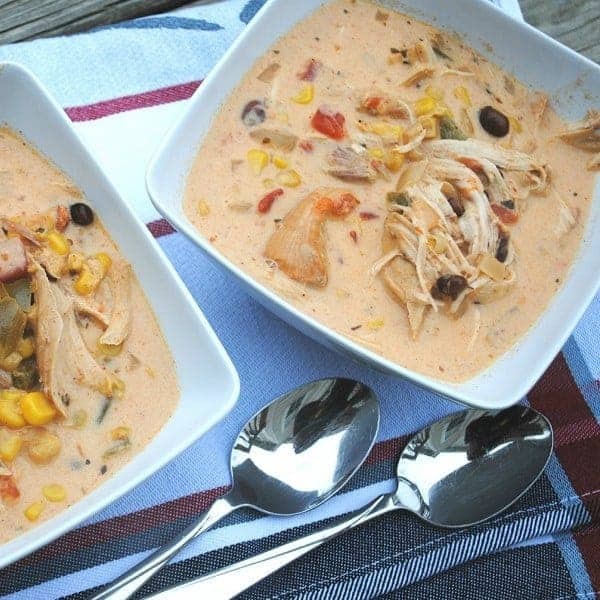 This will be a great way to use up the last of that turkey still hanging around. That looks quite delicious. 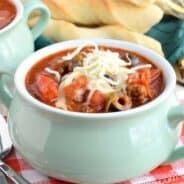 It seems easy to make and includes my favorite meat. It’s a must try! Thanks for sharing.